Reflux disease, sometimes called GERD or reflux esophagitis, happens when the muscle at the base of the esophagus opens up at the wrong time and allows the contents of the stomach to splash up into the esophagus. When these acidic stomach juices come into contact with the sensitive lining of the esophagus, a burning sensation may result. Heartburn and an “acid mouth” are other symptoms of reflux disease. However, many people consider these sensations normal and may not seek medical help. The esophagus is the long muscular tube in the chest area that connects the mouth to the stomach. In the lower part of the esophagus, just above the stomach, there is a strong, ring-like muscle that acts like a valve. This muscle tightens to keep stomach contents from moving back up into the esophagus. In this one-way system, the esophagus is sealed off from the stomach except during swallowing, burping, or vomiting. Then, the muscle relaxes just enough to open and allow food into the stomach. Heartburn, the most common symptom of reflux, is a burning sensation or pain that travels upward from the stomach. Heartburn often occurs after meals and can be brought on by eating fried, fatty, or spicy foods. Another common symptom of reflux is an acidic or bitter taste in the mouth caused by a backflow of stomach acid or food. This usually happens within 1 or 2 hours after eating. Both of these reactions can become worse if you lie down. Less common symptoms of reflux are chest pain and a salty- tasting fluid in the mouth. 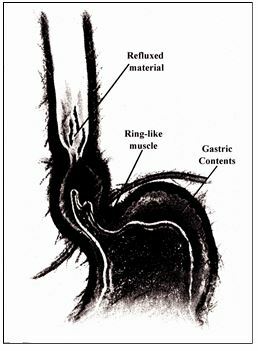 As the ring-like muscle relaxes, it allows stomach contents to “splash up” or reflux into the esophagus. Chronic reflux can cause such secondary problems as difficulty in swallowing, hoarseness or laryngitis that won’t go away, and damage to the vocal cords. Reflux can also cause or worsen respiratory problems, such as asthma and recurrent pneumonia, particularly if stomach contents get into the airways. However uncomfortable it might be, reflux disease is usually a mild disease that is rarely life-threatening. However, complications can develop when a person is not effectively treated. These can include bleeding or ulcers in the esophagus and, in a few cases, an actual narrowing of the esophagus itself. This may lead to difficulty in swallowing and food being caught in the narrowed opening. Chronic reflux may also be associated with Barrett’s esophagus, a condition that may lead to cancer. Elevate the head of your bed 4-12 inches with wood, cinder blocks or bricks. A pillow wedge that lifts the head and shoulders only may be substituted for the bed block. Take an antacid in liquid form (Maalox, Gelusil) 30-40 minutes after meals and at bedtime. If you are overweight, you should lose weight. Avoid eating 3 hours before retiring to bed. This will help keep the stomach empty when lying down. A bland diet divided into small feedings is recommended. 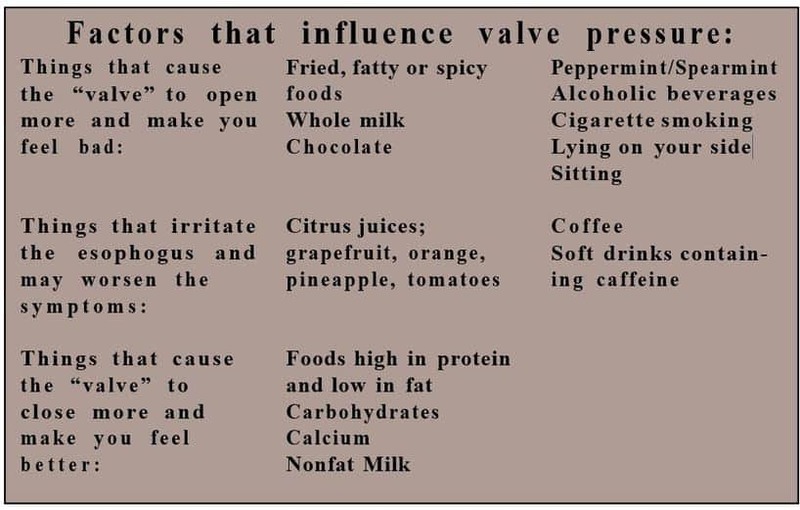 Avoid aspirin, chocolate, sweets, citrus fruits and juices, highly spiced food, alcohol, tobacco, and caffeine-containing beverages such as coffee, tea, or colas. Avoid tight fitting clothing across the midsection.